What is the CheckUp At Home Wellness Test for Dogs? 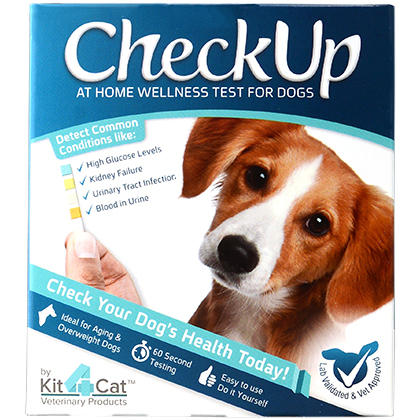 The CheckUp At Home Wellness Test for Dogs is a quick and easy pet health test kit that allows you to detect the most common pet health issues right in your own home. 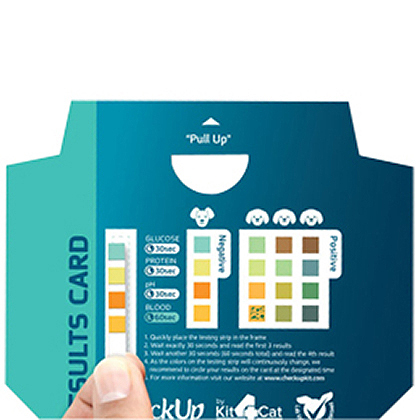 In just 60 seconds, you can test your pet's urine for high glucose levels, urinary tract infection, kidney failure, and blood in the urine. Periodically checking your pet's urine may help prevent health deterioration with early detection of serious health threats. The CheckUp At Home Wellness Test takes the guesswork out of deciding when to seek veterinary treatment. This is especially helpful for the care of aging and overweight pets. This easy, do-it-yourself kit comes with everything you need to cleanly collect and test your pet's urine in a non-invasive and stress-free manner. The CheckUp At Home Wellness Test for Dogs includes a disposable collection urine cup with a reusable telescopic pole for easy, clean urine collection. It also contains 2 testing strips, one sample collection vial, one sample collection pipette, and an easy-to-read results card, which quickly indicates positive or negative results for each parameter. Urine samples may be refrigerated to bring to your vet for further examination within 48 hours of collection. The CheckUp At Home Wellness Test for Dogs is an essential tool for monitoring your pet's health. How does the CheckUp At Home Wellness Test for Dogs work? The CheckUp At Home Wellness Test for Dogs contains everything you need to test your pet's urine for high glucose levels, urinary tract infection, kidney failure, and blood in the urine in the privacy of your own home. Test your dog's urine on a regular basis for general health monitoring, or at the first sign of illness for early detection and swift veterinary treatment. The CheckUp At Home Wellness Test for Dogs is an important tool in the care of aging or overweight dogs, as well as those with known medical conditions such as diabetes, kidney disease or frequent urinary tract infections. Urine samples collected with the CheckUp At Home Wellness Test for Dogs may be refrigerated and delivered to your vet within 48 hours of collection for further examination. The CheckUp At Home Wellness Test for Dogs should not replace a visit to your vet or annual routine visits. CheckUp is ideal for in between routine visits or for pet owners that require frequent urine collection by their vet. CheckUp is not designed to diagnose a problem or to replace a visit to your veterinarian. We recommend you call your veterinarian for more information and consultation on the results of your pet's test, positive or negative. A positive result for any of the above parameters can have serious implications for the wellness of your dog which should be discussed with your veterinarian. Assemble the pole - Screw the metal ring into the end of the telescopic pole. Pull the metal ring to extend the pole. Then, place the cup in the metal ring. Collect a urine sample - Catch a sample by lowering the collection cup into the urine stream while your dog is urinating. Carefully seal the cup with the included lid and bring the sample home for testing. As the colors on the testing strip will continuously change, we recommend you circle your results on the Results Card at the designated time. To avoid contamination, make sure the collection cup is clean and seal it after collection with the included lid. 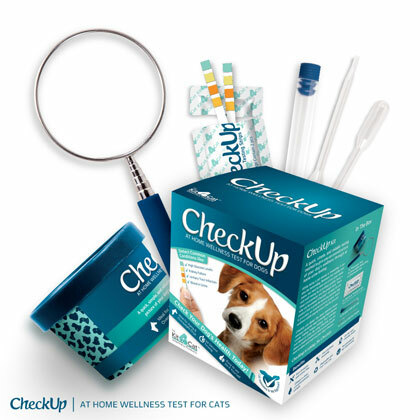 The CheckUp At Home Wellness Test for Dogs collection cup and test strips are for one time use only and should not be used for multiple tests. 1 Telescopic Pole, 1 Detachable Metal Ring, 1 Disposable Collection Cup, 2 Identical Testing Strips, 1 Sample Collection Vial, 1 Sample Collection Pipette, 1 Results Card.